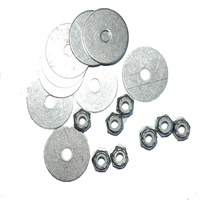 10-32 Stainless Locking Nuts & Washers. Stay tight even with heavy vibration. Washers are fender style offering a large displacement area. For a waterproof seal use a small amount of silicone sealant. From Anonymous of Sonoma, California on 12/10/2012 .